Even before the show’s second year had begun, Bryan Fuller had hinted that the fourth episode would be where a major shift would happen. He was not lying. Thus, we may unfortunately have to say goodbye to Hettienne Park’s Beverly Katz. Introduced along with Aaron Abrams’ Brian Zeller and Scott Thompson’s Jimmy Price in the first episode as a trio of crime scene investigators, Beverly and her compatriots seemed designed to dispense bits of levity that were missing from a show that tended towards the perpetually bleak and somber. Personally, I’ve always found the three’s bantering a tad out of place in most instances, as if several characters from a show like Bones suddenly found themselves in a much different universe. Since Will’s capture, however, the writers have slowly developed Beverly into much more of a full-fledged character. Certainly, out of the three, she was the closest to Will and, thus, his imprisonment has hit her the hardest. Moreover, she has been the one keeping Will in the loop throughout the season, providing him with several of the FBI’s current cases to analyze. As the episode opens, Beverly is frustrated with Will for continuing to bang the “Hannibal did it” drum. Soon after, the team is drawn into yet another bizarre murder case wherein the victim’s eyes have been gouged out and his body covered in bee stings. (At this point, I’m sure the characters are wondering why they can never get a killer with a simpler kill method.) This time around, the killer is actually an alternative medicine woman named Katherine Pims (played by Amanda Plummer, who manages to play up her character’s sweetness, despite the horrific activities she engages in) who targets those who are terminally ill and suffering. In yet another how-is-this-on-network-television moment, one scene finds Katherine paralyzing a elder patient via acupuncture needles before gently hammering a lengthy needle into his eye, effectively lobotomizing him. The episode also marks the long-awaited return of Gina Torres as Jack Crawford’s cancer-afflicted wife, Bella. When we last saw Bella, she had found herself in a whirlwind of existential despair regarding her lung cancer diagnosis. The fact that she had to witness her own mother fall victim to such a disease only exacerbates her fear and isolation. Within in the first few minutes, during a session with Hannibal, Bella freely admits she has strongly considered suicide. This reveal leads to one of the show’s most haunting moments. Bella arrives at Hannibal’s office, somewhat jovial for once. If that wasn’t enough, she also gifts Hannibal with a specially made coin as thanks for his services. She soon reveals, however, that she has taken an overdose of morphine in an attempt to end her suffering. Shortly after asking Hannibal to tell Jack she’s sorry and that she loves him, Bella slumps into unconsciousness. Then, in a bit of business that’s downright Harvey “Two-Face” Dent in its execution, Hannibal flips his gift coin. After seeing the result, he uses a nearby syringe to revitalize Bella—much to her dismay. It’s here that both the Katherine Pim and Bella storylines—while seemingly at opposite ends of the episode’s structure at first—ultimately converge. If not in a literal way, than certainly in a thematic way. As Katherine sees it, she is not killing her patients but rather easing their miserable descent into death. She is, in her own mind, an angel of mercy. Watching Jack listen to her explanation, it’s hard to think he doesn’t finds some validity in her warped mindset after dealing with his dying wife for some time. Katherine and Bella’s connection becomes all the more apparent considering that Katherine’s explanation of her methods is paired directly with Bella’s suicide scene. Meanwhile, in a last ditch attempt at recalling his lost memories, Will volunteers for an extremely unorthodox therapeutic technique involving injecting experimental chemicals into his body. As filmed by episode director David Semel, Will’s memory flashes presents yet another opportunity for some properly freaky visual imagery—this means seizure-inducing flashing lights, characters with digitally warped faces and accompanying music that sounds like the score from a silent horror film from the 1920s. From this session, Will begins re-forming the memories that were lost to him during his frequent season one blackouts. As he suspected, Hannibal perfectly orchestrated these blackouts during their therapy sessions as a means of one day framing him for murder. Things come to a head when Beverly pays Will another visit and reveals that human muralist James Gray was missing a liver. 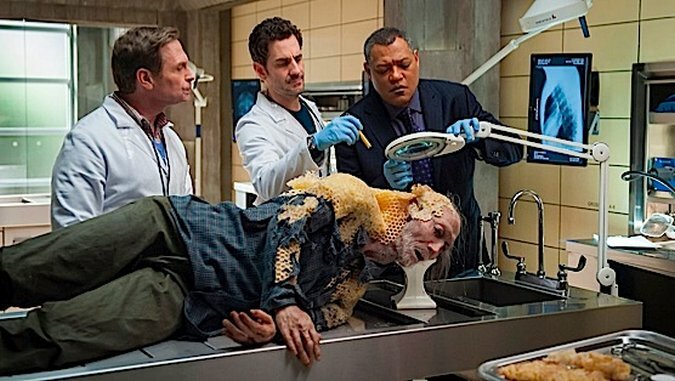 Here, Will finally deduces what we’ve known all along—Hannibal has been eating the organs he took from his victim’s bodies and, more distressingly, serving them to whoever has the misfortune to dine in his company. Hearing this, Beverly breaks into the good psychiatrist’s home and searches around for evidence. She soon discovers some blood pumping out of the basement and heads down to investigate. Indeed, she discovers something horrific—Hannibal is there waiting to assault her. Cue cliffhanger. Hannibal’s attack on Beverly appears to retroactively justify a moment I bumped against earlier in the episode when Hannibal and Beverly were looking over James Gray’s body. In response to Beverly’s confusion about the state of the body, Hannibal provides her with some advice for solving the case. “You have to get to the truth beneath the appearances,” he claims, “only by getting deep beneath the skin will you understand the nature of this pathology.” Here, Hannibal almost seems to play the role of a show head writer, highlighting the overarching theme of the whole series. It’s a moment I nevertheless felt was a bit on the nose. Looking back on it now, I wonder if Hannibal used such transparent dialogue as a means of eventually luring Beverly into his trap. The episode does, after all, open with Will’s dream of fishing with the late Abigail Hobbs wherein he explains to her an old superstition about how people will name bait after a loved one—the idea being that if the loved one cherished the fisher, then they would catch the fish. Beverly, it seems, has now become the bait. A few days ago, i09 published an article that asked, “What network TV show is as smart as any cable show?” One of the top answers—alongside The Good Wife and Person of Interest—was Hannibal. Of course Hannibal stands out not only because of the level of gore it depicts (though, admittedly, that’s part of it) but because there’s a genuine emotional rawness in its writing and acting that you almost never seen in network TV. In an episode where a man has a needle gouged through his eyes and a major recurring character potentially meets her demise, it’s telling that the moment that stayed with me the most was hearing Bella’s cries of anguish upon realizing her suicide attempt had been thwarted. With Beverly Katz’s fate up in the air, the series has set a major cliffhanger that has me begging to see the next episode as soon as possible. I now feel as though, more than ever, I have a major kinship with Will Graham. We both, it seems, always have Hannibal on the mind.